Earn the Bramblebreach Clan's trust. Bramblebreach — Negotiate with the Bramblebreach clan for the Dominion. The Bosmer in this part of the Valenwood are opposed to the Dominion. I've agreed to negotiate and attempt to convince them to swear allegiance to Queen Ayrenn. Talk to Hazazi in Bramblebreach. Collect Kallopi seeds and essence. (Optional): Talk to Andur. Plant the four Kallopi seeds, then defeat the Orc Chieftain. "It is good to see you again, my friend. Greenshade is a far more exciting place than Raz expected. He hears now that the Staff of Magnus has been stolen? As if these rebellious Bosmer weren't trouble enough!" Are the Wood Elves here rebelling against the Dominion? "Not yet... but it is possible. The Elves in this part of the Valenwood do not follow King Camoran. They claim to be subjects of the "Wilderking," some forest spirit no one has ever seen. They mock the Dominion and call Queen Ayrenn an enemy!" Why are they opposed to Queen Ayrenn? "We do not know. The Battlereeve sent a soldier, Hazazi, to negotiate with the Bramblebreach Clan, but he has made no progress. Now Raz needs to hunt for the Staff of Magnus. So he asks you. Will you find Hazazi and sort this out?" Yes. I'll take care of it. "The Bramblebreach village is just south of Marbruk. Hazazi is there. He likes to complain, but he's a good soldier. He just needs someone with a more sophisticated negotiation style. And by the time you get back, Raz will have a lead on the staff!" How are the Bramblebreach different from other Wood Elves? "This one does not understand Bosmer clan politics. But as Raz hears it, the clans of this part of Valenwood have always been wild. Some even sided against King Camoran in the Blacksap Rebellion." Then why hasn't something been done about them before? "Greenshade is the heart of Valenwood. It is very dangerous and very mysterious, and these Bosmer understand it like no others do. Raz would not be deterred, but even Camoran's Vinedusk Rangers avoid traveling in this part of the forest." Why were you sent to Greenshade in the first place? "As always, Raz serves the queen. She wanted to know if the Bosmer here are as scary as they sound. With the Staff of Magnus stolen, though, Raz must make that his priority. This one knows you can handle the Bramblebreach as well as he could." Who do you think stole the Staff of Magnus? "The obvious answer is probably the right one. Pelidil. That toad fulfilled Naemon's every wish. Why should that change just because the Prince is dead? Raz knew the Veiled Heritance was a disease not so easily excised. Hmph." So what do you still need to investigate? "If Pelidil has taken the staff, we need to find him. And discover what he plans to do with it. The staff is powerful and dangerous. All of the Dominion is at risk if we cannot find it." "Dark Moons! These crazy Bosmer make no sense! Hazazi comes to negotiate on behalf of Queen Ayrenn, to hear their grievances, and all they do is dance and jest! Hazazi has only been here a short while and already he hates this village." Razum-dar sent me to help with your negotiations. "What negotiations? These dungy Elves don't want talk. They say the only answer to the "Wilderking." Who is this? Who knows? They'd rather pull Hazazi's tail than give him a straight answer! It's not fair. Hazazi always gets the worst assignments." Maybe I should just speak to them myself. "Hazazi likes this idea. If you can just get the Bramblebreach to make sense, this one will be impressed. 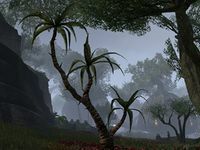 Hazazi thinks it's a wild guar chase, but if you want to try, speak with their Treethane. May you have better luck than Hazazi!" They're not happy with Queen Ayrenn? "No. These dungy little monsters are opposed to the Dominion, and to Queen Ayrenn specifically. Why? Who knows? They will not give Hazazi a straight answer. They'd rather pull his tail!" "Yes! If you can get the Bramblebreach to make sense and convince them not to oppose us, the queen will be very happy. 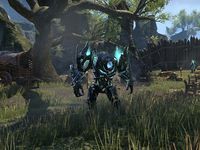 Hazazi thinks it's a wild guar chase, but if you want to try, speak with their Treethane. May you have better luck than Hazazi! I'll look for the Treethane then. "Whoops! I'm sorry. I didn't see you there. I almost ran right into you. I guess I'm a little distracted. Anyhow, I hope you'll forgive me." "Yes, it's just that treethane. It's not my place to say, but I wonder if she isn't just a few leaves shy of a full tree. I mean ... I came to speak to her in the spirit of scholarly study, but she treated me as a child! She said 'run along now'." "I have no idea. I've never done anything to offend her. I've never even met her! I should be going though. Someone's waiting on me, and he can get a little impatient." "Another tourist? Rare to have so many visitors in this part of the Valenwood. Didn't you hear? It's much safer behind the shiny new walls of Marbruk. Even King Camoran hesitates to venture into the Court of the Wilderking." I'm here to negotiate on behalf of the Dominion. Huh. Problem is that our allegiance is to the Wilderking, and he doesn't seem to care for your Dominion. Can I speak with the Wilderking? "Ha! Sure Let [sic] me just pull him from my satchel! You people don't understand. The Wilderking manages the entire forest! He doesn't have time for idle talk. Why do you think so many people doubt his existence?" Have you ever spoken with the Wilderking? "Not in person, but I don't doubt the Wilderking exists. He speaks to me in the babbling brooks and the wind in the trees. Other Bosmer petition him for an audience, but I don't need to. He already tells me everything I need to know." Can I petition him for an audience? "Hmm. I could tell you, but how do I know you're trustworthy? You ask us to share your enemies, but will you share ours? The Wood Orcs are a plague we can't seem to be rid of. If you help us drive them off, I'll tell you what you want to know." How do I drive them away? "Lurchers. Take seeds from the Shimmering Tree in the village and plant them in the Orcs' camp. In a few minutes, they'll sprout out with a vengeance. The Orc Chieftain won't surrender so easily though. Just kill him. Leave the rest to the lurchers. All right. I think I can handle that. "Don't bother coming back until you've run off the Orcs. I've got important business to attend to. Heh." So how do these seeds actually work? Well, if you plant them in some peat, they sprout into a flower, and then after some time, the flower grows into a lurcher. If you want more than that, you can ask the Wilderking himself ... when you get that audience .... Heh. What exactly are these lurchers? "They're gifts from the Wilderking—embodiments of the raw energy of the forest. They protect the village. They're not so smart. We can't lead them against the Orcs, but if they sprout straight into the Orcs' camp, they'll know what to do." "Was the treethane as rude to you as she was to me? All I asked was how one might get an audience with the Wilderking, but the way she reacted, you would have thought I was trying to slaughter her children. Did she treat you any differently?" She asked me to help drive the Wood Orcs away. "She did? That's funny ... because Andur and I offered to drive the Orcs away and she turned us down! I don't know. I'm beginning to suspect this is some elaborate Bosmer trick, and the whole village is laughing at us when we're not looking." You don't think the Wilderking exists? "I didn't say that. There is definitely a distinctive magical force in this part of Valenwood. But I fail to understand by what logic the treethane decides who gets an audience with the Wilderking and who gets turned away." Why do you seek an audience with the Wilderking? "Oh! I'm Aranias. Maybe you read my book, "Spriggans in the Green: Story and Myth in Primitive Bosmer Society"? Probably not, I guess. Anyhow, Andur and I came in a scholarly pursuit, to see if this Wilderking is as powerful as they say." So what will you do now? "We'll just have to venture deeper into the forest on our own. We'll probably get lost and suffer a slow and painful death, but that's the risk we have to take. If you're going after the Wood Orcs though, I know something that might make it easier." "If you want, you can take the essence from the Kollopi Tree and rub it all over your body to cloak yourself in a haze of forest moths. The Wood Orcs won't even see you." "Oh! One more thing—Andur scouted out the Orcs' Camp pretty extensively. He might have some useful observations if you ask. Good luck with the Wood Orcs ... and that tricky treethane. Maybe we'll meet again when we find the Wilderking." What do you know about the Wilderking? "There seem to be a lot more rumors than any real facts. Some say he's a man. Others say he's a spirit, an embodiment of the forest. What I find most fascinating though is the rumor that he actually shapes the entire forest. That's just incredible!" "Me? I was born and raised in the Summerset Isles, on a rather small island known as Silatar. It's a pretty secluded place. Growing up there was what first sparked my interest in studying nature magic, but ... well, it was very lonely." Is Andur actually a scholar as well? "Ha! Of course not. He's mainly here acting as my guardian. They warned us that this place was dangerous, and if the Wilderking is really as unpredictable as people say ... well, it never hurts to be prepared." "I spent several hours watching the Wood Orcs and evaluating their weaknesses. As a whole, their strength is in numbers. As long as you don't take on the entire camp, you should be fine. The chieftain's the one you have to watch out for." What's so tough about the Chieftain? "By the look of his scars, he's seen his share of battle, and he knows how to take a beating. Don't expect him to go down quickly. There's a shaman who's never far from his side as well. I'd focus on killing the shaman first. Good luck." Walk over to the Shimmering Kollopi Tree beside Andurs and Aranias, and search it. You will find Kollopi Essence and Kollopi Seeds, the former of which can be used as a disguise. Just south of the tree, you will find a passage to the Wood Orc Camp. Enter it, avoiding or killing the Lhurgash Clan members you encounter along the way to the seed locations. If your disguise is lost in the camp, there are a number of Kollopi trees in it which hold more disguises. Head north along the path to get to the locations to plant the seeds. The closest peat mound, the northeastern one, is on the east path of the first fork in the road; there are two Wood Orcs working at a tree stump there and a sentry who regularly checks on them. A guardian will quickly emerge from the peat mound, and just as quickly be overwhelmed by the Orcs. Follow the same path south to find the central peat mount; this one is tended by one Orc and occasionally patrolled by a sentry. The lurcher that emerges may not be overpowered by the Orcs, in which case it will fade away. The southern mound is further along the path, amidst a number of longhouses and orcs. A sentry regularly patrols it; remaining undetected while planting the seed may be difficult. Follow the path to the northern peat mound. The northern seed is nearly impossible to plant undetected, as a group of sentries sits around it. "My scouts came back singing your praises! They said the Wood Orcs broke quickly after you killed Chieftain Thragdosh and unleashed the guardians. Hmph. I wasn't exactly expecting you to succeed. Seems there's more to you than meets the eye." I believe we had an arrangement. "Ha! And you're worried I won't hold up my end of the bargain? No no. I keep my promises. You got rid of those parasitic Orcs—you've earned the right to petition the Wilderking for an audience." I should search for a soldier named Hazazi who came to speak with the Bramblebreach tribe. I should speak to the Bramblebreach treethane to find out why they're opposed to the Dominion. I need to speak to the mysterious "Wilderking." The Bramblebreach treethane will tell me how to petition for an audience if I deal with the Wood Orcs. I must first gather seeds from the Shimmering Tree. 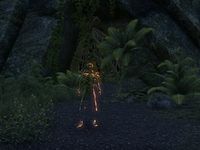 A young Altmer woman addressed me as I approached the Shimmering Tree. I should speak to her to hear what she has to say. I should gather both Seeds and Essence from the "Kollopi" Tree to frighten off the Wood Orcs and learn how to petition the Wood Elves' mysterious liege, the "Wilderking." 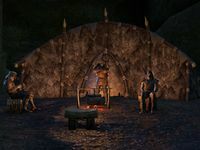 Option Steps: The young Altmer scholar Aranias said her guardian Andur had scouted out the Wood Orcs' camp and might have some good advice if I care to ask. I should plant the Kollopi Seeds around the Wood Orcs' camp. The seeds will sprout into guardians that will help drive the Wood Orcs away. I planted Kollopi Seeds that will sprout guardians around the Wood Orcs' camp. Now I need to kill the Wood Orc chieftain to ensure the group is drive away to leave the Bramblebreach Wood Elves in peace. I have sown Kollopi Seeds to sprout guardians within the Wood Orcs' camp and I've killed their chiefain to drive them away. I should return and speak to the Bramblebreach treethane. This page was last modified on 18 October 2018, at 00:24.